2 one Help Defend Your Retirement Pacific PremierCare Advantage You ve worked hard to build your retirement assets. Now, you and your family enjoy a special quality of life because you ve wisely nurtured your financial well-being. Yet what would happen to your financial independence if you were to suddenly fall ill and require long-term care? Who would help pick up the pieces for unplanned expenses? How could the cost of care impact what you ve carefully saved for retirement? Pacific PremierCare Advantage, universal life insurance with long-term care benefits, can help you maintain the quality of life you ve come to expect and the freedom of choice you want to protect. 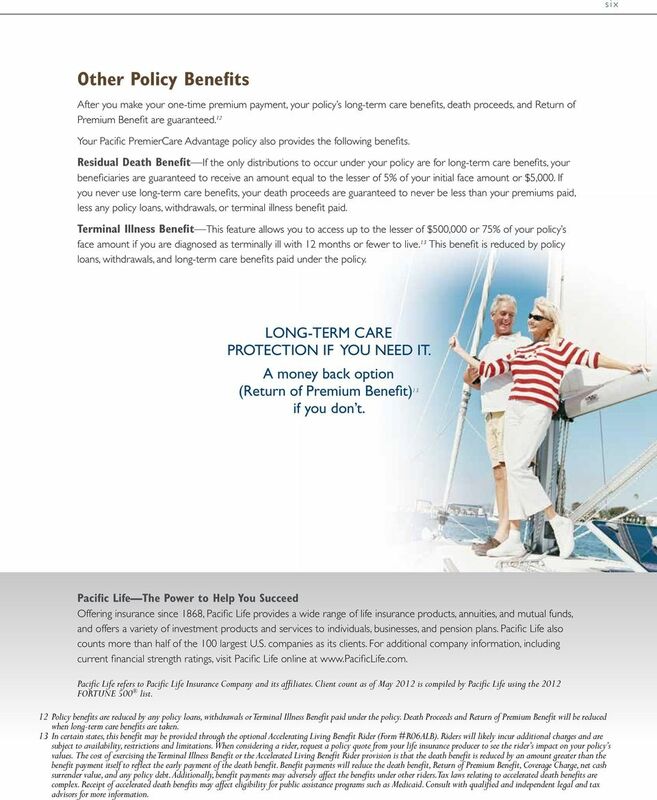 Pacific PremierCare Advantage: Increase Funds Available for Long-Term Care Expenses 2 Money Back Option (Return of Premium Benefit) 2 Tax-Free 3 Death Proceeds to Beneficiaries 2 2 Policy benefits are reduced by any policy loans, withdrawals or Terminal Illness Benefit paid under the policy. Death Proceeds and Return of Premium Benefit will be reduced when long-term care benefits are taken. 3 For federal income tax purposes, life insurance death benefits generally pay income tax-free to beneficiaries pursuant to IRC Section 101(a)(1). In certain situations, however, life insurance death benefits may be partially or wholly taxable. Situations include, but are not limited to: the transfer of a life insurance policy for valuable consideration unless the transfer qualifies for an exception under IRC Section 101(a)(2) (i.e. the transfer-for-value rule ); arrangements that lack an insurable interest based on state law; and an employer-owned policy unless the policy qualifies for an exception under IRC Section 101(j). Additionally, a portion of your Pacific PremierCare Advantage s Death Proceeds may be income taxable if the policy was issued as part of an IRC Sec income tax-free exchange. Consult with qualified and independent legal and tax advisors. Investment and Insurance Products: Not a Deposit Not FDIC Insured Not Insured by any Federal Government Agency No Bank Guarantee May Lose Value Pacific PremierCare Advantage is issued by Pacific Life Insurance Company. Product availability and features may vary by state. 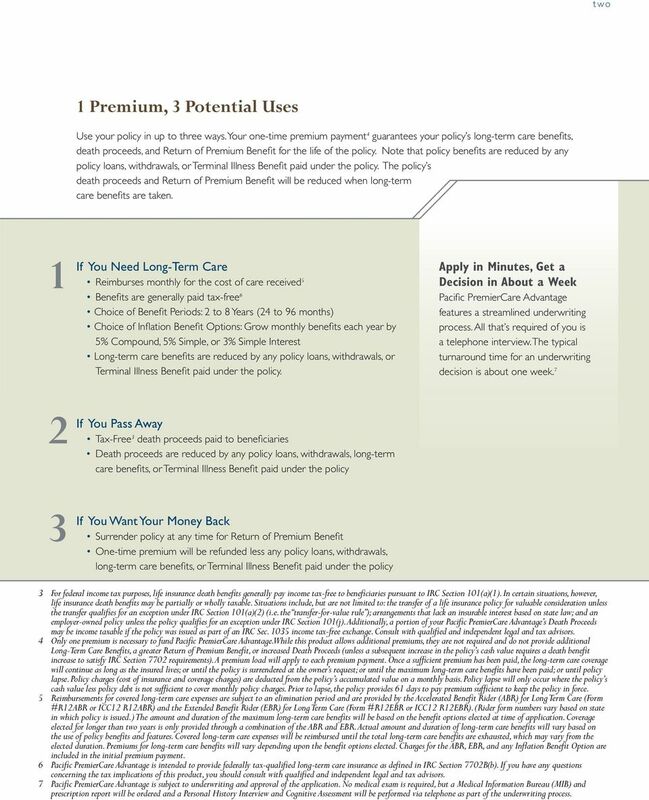 3 two 1 Premium, 3 Potential Uses Use your policy in up to three ways. Your one-time premium payment 4 guarantees your policy s long-term care benefits, death proceeds, and Return of Premium Benefit for the life of the policy. Note that policy benefits are reduced by any policy loans, withdrawals, or Terminal Illness Benefit paid under the policy. The policy s death proceeds and Return of Premium Benefit will be reduced when long-term care benefits are taken. 1 If You Need Long-Term Care Reimburses monthly for the cost of care received 5 Benefits are generally paid tax-free 6 Choice of Benefit Periods: 2 to 8 Years (24 to 96 months) Choice of Inflation Benefit Options: Grow monthly benefits each year by 5% Compound, 5% Simple, or 3% Simple Interest Long-term care benefits are reduced by any policy loans, withdrawals, or Terminal Illness Benefit paid under the policy. Apply in Minutes, Get a Decision in About a Week Pacific PremierCare Advantage features a streamlined underwriting process. All that s required of you is a telephone interview. The typical turnaround time for an underwriting decision is about one week. 7 2 If You Pass Away Tax-Free 3 death proceeds paid to beneficiaries Death proceeds are reduced by any policy loans, withdrawals, long-term care benefits, or Terminal Illness Benefit paid under the policy 3 If You Want Your Money Back Surrender policy at any time for Return of Premium Benefit One-time premium will be refunded less any policy loans, withdrawals, long-term care benefits, or Terminal Illness Benefit paid under the policy 3 For federal income tax purposes, life insurance death benefits generally pay income tax-free to beneficiaries pursuant to IRC Section 101(a)(1). In certain situations, however, life insurance death benefits may be partially or wholly taxable. Situations include, but are not limited to: the transfer of a life insurance policy for valuable consideration unless the transfer qualifies for an exception under IRC Section 101(a)(2) (i.e. the transfer-for-value rule ); arrangements that lack an insurable interest based on state law; and an employer-owned policy unless the policy qualifies for an exception under IRC Section 101(j). Additionally, a portion of your Pacific PremierCare Advantage s Death Proceeds may be income taxable if the policy was issued as part of an IRC Sec income tax-free exchange. Consult with qualified and independent legal and tax advisors. 4 Only one premium is necessary to fund Pacific PremierCare Advantage. While this product allows additional premiums, they are not required and do not provide additional Long-Term Care Benefits, a greater Return of Premium Benefit, or increased Death Proceeds (unless a subsequent increase in the policy s cash value requires a death benefit increase to satisfy IRC Section 7702 requirements). A premium load will apply to each premium payment. Once a sufficient premium has been paid, the long-term care coverage will continue as long as the insured lives; or until the policy is surrendered at the owner s request; or until the maximum long-term care benefits have been paid; or until policy lapse. Policy charges (cost of insurance and coverage charges) are deducted from the policy s accumulated value on a monthly basis. Policy lapse will only occur where the policy s cash value less policy debt is not sufficient to cover monthly policy charges. Prior to lapse, the policy provides 61 days to pay premium sufficient to keep the policy in force. 5 Reimbursements for covered long-term care expenses are subject to an elimination period and are provided by the Accelerated Benefit Rider (ABR) for Long Term Care (Form #R12ABR or ICC12 R12ABR) and the Extended Benefit Rider (EBR) for Long Term Care (Form #R12EBR or ICC12 R12EBR). (Rider form numbers vary based on state in which policy is issued.) The amount and duration of the maximum long-term care benefits will be based on the benefit options elected at time of application. Coverage elected for longer than two years is only provided through a combination of the ABR and EBR. Actual amount and duration of long-term care benefits will vary based on the use of policy benefits and features. Covered long-term care expenses will be reimbursed until the total long-term care benefits are exhausted, which may vary from the elected duration. Premiums for long-term care benefits will vary depending upon the benefit options elected. Charges for the ABR, EBR, and any Inflation Benefit Option are included in the initial premium payment. 6 Pacific PremierCare Advantage is intended to provide federally tax-qualified long-term care insurance as defined in IRC Section 7702B(b). If you have any questions concerning the tax implications of this product, you should consult with qualified and independent legal and tax advisors. 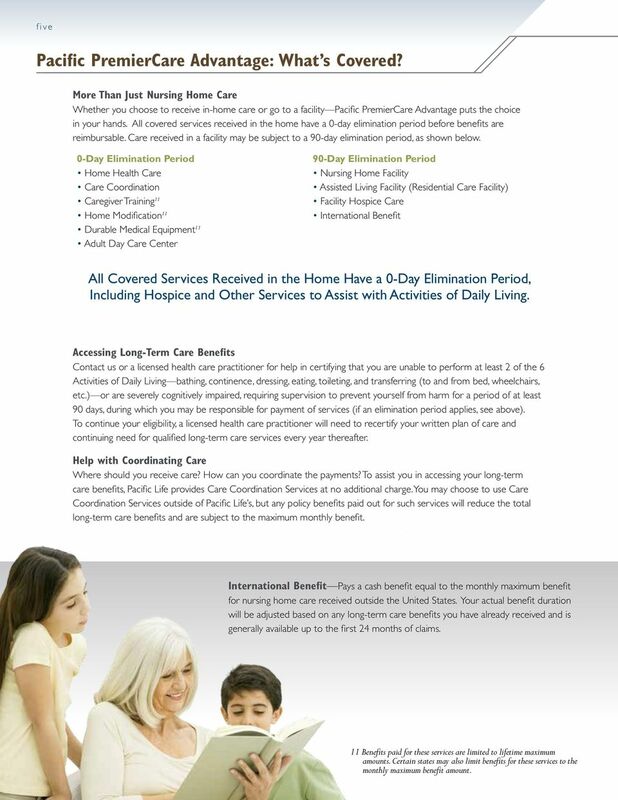 7 Pacific PremierCare Advantage is subject to underwriting and approval of the application. No medical exam is required, but a Medical Information Bureau (MIB) and prescription report will be ordered and a Personal History Interview and Cognitive Assessment will be performed via telephone as part of the underwriting process. 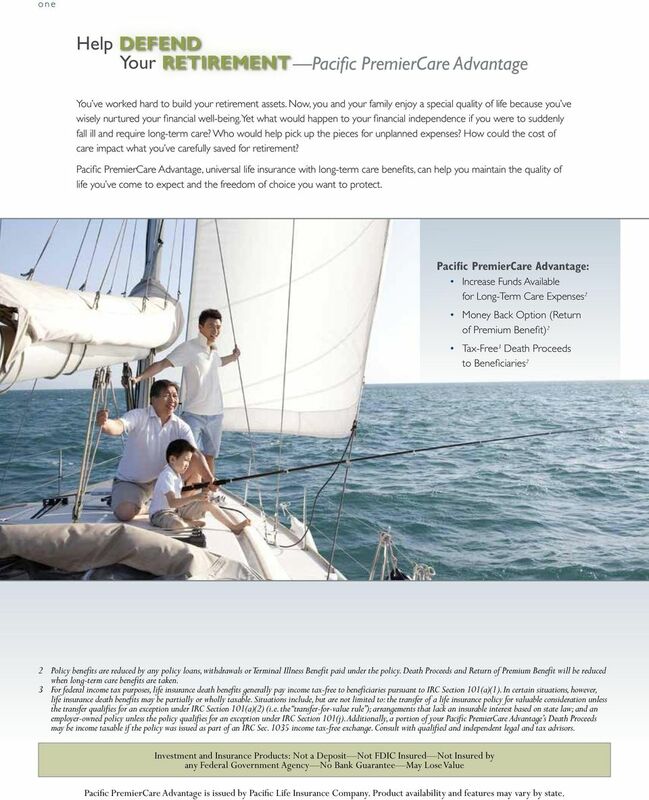 4 three Pacific PremierCare Advantage: What Can It Do for You? 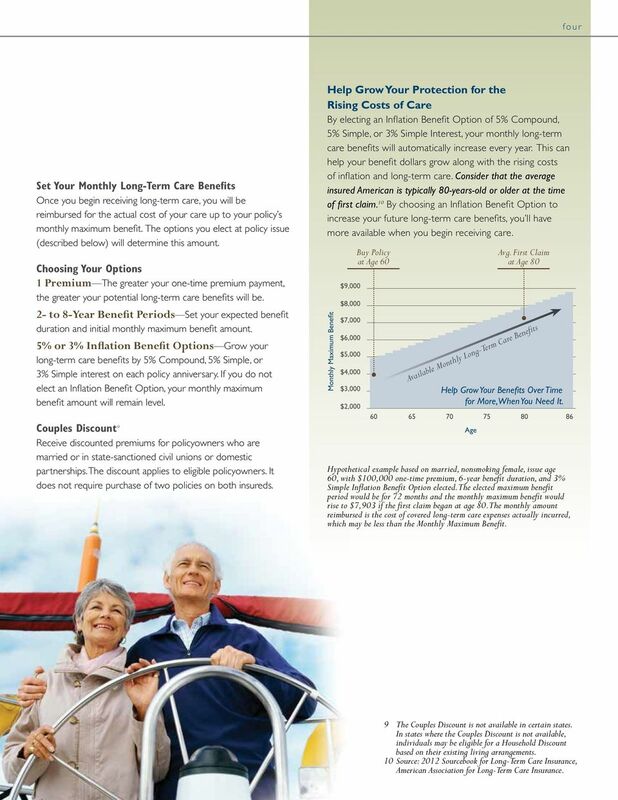 Pacific PremierCare Advantage may increase the funds you have available to help pay for qualified long-term care services on day one of your policy and each year afterwards if you elect an Inflation Benefit Option (see next page). Your beneficiaries may receive tax-free 8 death proceeds should you pass away before or while receiving long-term care, and with the Return of Premium Benefit, you can commit to a plan worry-free. Hypothetical Examples Reposition a portion of current assets as one-time premium ($100,000 to each policy) Female insured, nonsmoker, issue age 60, 6-year benefit period with 3% Simple Interest Inflation Benefit Option elected at policy issue and Couples Discount applied. For Her Male insured, nonsmoker, age 60, 6-year benefit period with 3% Simple Interest Inflation Benefit Option elected and Couples Discount applied. 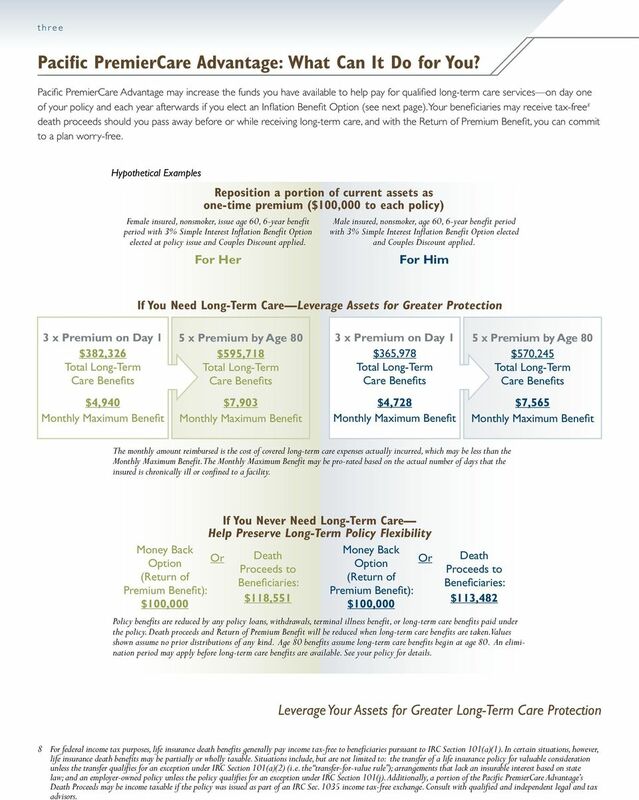 For Him If You Need Long-Term Care Leverage Assets for Greater Protection 3 x Premium on Day 1 $382,326 Total Long-Term Care Benefits 5 x Premium by Age 80 $595,718 Total Long-Term Care Benefits 3 x Premium on Day 1 $365,978 Total Long-Term Care Benefits 5 x Premium by Age 80 $570,245 Total Long-Term Care Benefits $4,940 $7,903 $4,728 $7,565 The monthly amount reimbursed is the cost of covered long-term care expenses actually incurred, which may be less than the. The may be pro-rated based on the actual number of days that the insured is chronically ill or confined to a facility. If You Never Need Long-Term Care Help Preserve Long-Term Policy Flexibility Money Back Money Back Option Or Death Option Or Proceeds to (Return of (Return of Beneficiaries: Premium Benefit): Premium Benefit): $118,551 $100,000 $100,000 Death Proceeds to Beneficiaries: $113,482 Policy benefits are reduced by any policy loans, withdrawals, terminal illness benefit, or long-term care benefits paid under the policy. Death proceeds and Return of Premium Benefit will be reduced when long-term care benefits are taken. Values shown assume no prior distributions of any kind. Age 80 benefits assume long-term care benefits begin at age 80. An elimination period may apply before long-term care benefits are available. See your policy for details. Leverage Your Assets for Greater Long-Term Care Protection 8 For federal income tax purposes, life insurance death benefits generally pay income tax-free to beneficiaries pursuant to IRC Section 101(a)(1). In certain situations, however, life insurance death benefits may be partially or wholly taxable. Situations include, but are not limited to: the transfer of a life insurance policy for valuable consideration unless the transfer qualifies for an exception under IRC Section 101(a)(2) (i.e. the transfer-for-value rule ); arrangements that lack an insurable interest based on state law; and an employer-owned policy unless the policy qualifies for an exception under IRC Section 101(j). Additionally, a portion of the Pacific PremierCare Advantage s Death Proceeds may be income taxable if the policy was issued as part of an IRC Sec income tax-free exchange. Consult with qualified and independent legal and tax advisors. 5 four Set Your Monthly Long-Term Care Benefits Once you begin receiving long-term care, you will be reimbursed for the actual cost of your care up to your policy s monthly maximum benefit. The options you elect at policy issue (described below) will determine this amount. Choosing Your Options 1 Premium The greater your one-time premium payment, the greater your potential long-term care benefits will be. 2- to 8-Year Benefit Periods Set your expected benefit duration and initial monthly maximum benefit amount. 5% or 3% Inflation Benefit Options Grow your long-term care benefits by 5% Compound, 5% Simple, or 3% Simple interest on each policy anniversary. If you do not elect an Inflation Benefit Option, your monthly maximum benefit amount will remain level. Couples Discount 9 Receive discounted premiums for policyowners who are married or in state-sanctioned civil unions or domestic partnerships. The discount applies to eligible policyowners. It does not require purchase of two policies on both insureds Help Grow Your Protection for the Rising Costs of Care By electing an Inflation Benefit Option of 5% Compound, 5% Simple, or 3% Simple Interest, your monthly long-term care benefits will automatically increase every year. This can help your benefit dollars grow along with the rising costs of inflation and long-term care. Consider that the average insured American is typically 80-years-old or older at the time of first claim. 10 By choosing an Inflation Benefit Option to increase your future long-term care benefits, you ll have more available when you begin receiving care. $9,000 $8,000 $7,000 $6,000 $5,000 $4,000 $3,000 $2,000 Buy Policy at Age 60 Available Monthly Long-Term Care Benefits Help Grow Your Benefits Over Time for More, When You Need It Hypothetical example based on married, nonsmoking female, issue age 60, with $100,000 one-time premium, 6-year benefit duration, and 3% Simple Inflation Benefit Option elected. The elected maximum benefit period would be for 72 months and the monthly maximum benefit would rise to $7,903 if the first claim began at age 80. The monthly amount reimbursed is the cost of covered long-term care expenses actually incurred, which may be less than the. Age Avg. First Claim at Age 80 9 The Couples Discount is not available in certain states. In states where the Couples Discount is not available, individuals may be eligible for a Household Discount based on their existing living arrangements. 10 Source: 2012 Sourcebook for Long-Term Care Insurance, American Association for Long-Term Care Insurance. 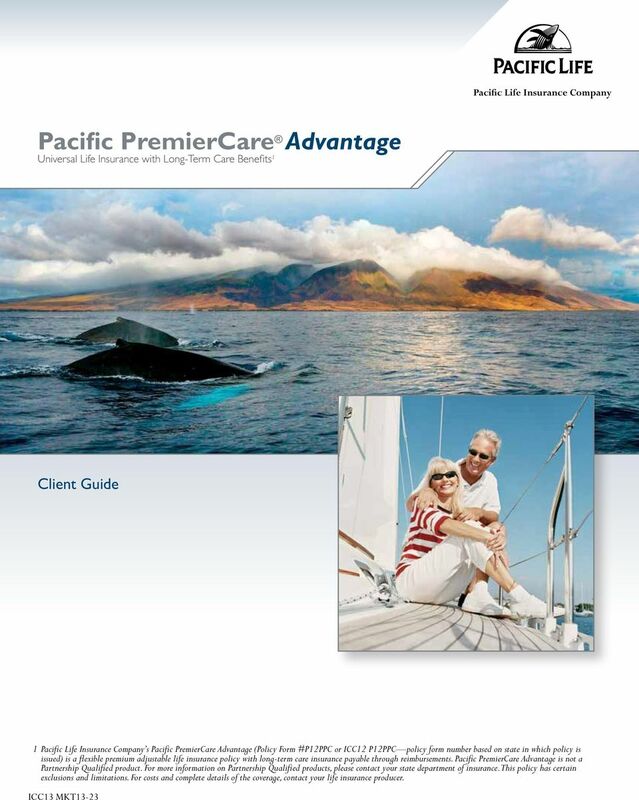 6 five Pacific PremierCare Advantage: What s Covered? More Than Just Nursing Home Care Whether you choose to receive in-home care or go to a facility Pacific PremierCare Advantage puts the choice in your hands. All covered services received in the home have a 0-day elimination period before benefits are reimbursable. Care received in a facility may be subject to a 90-day elimination period, as shown below. 0-Day Elimination Period Home Health Care Care Coordination Caregiver Training 11 Home Modification 11 Durable Medical Equipment 11 Adult Day Care Center 90-Day Elimination Period Nursing Home Facility Assisted Living Facility (Residential Care Facility) Facility Hospice Care International Benefit All Covered Services Received in the Home Have a 0-Day Elimination Period, Including Hospice and Other Services to Assist with Activities of Daily Living. Accessing Long-Term Care Benefits Contact us or a licensed health care practitioner for help in certifying that you are unable to perform at least 2 of the 6 Activities of Daily Living bathing, continence, dressing, eating, toileting, and transferring (to and from bed, wheelchairs, etc.) or are severely cognitively impaired, requiring supervision to prevent yourself from harm for a period of at least 90 days, during which you may be responsible for payment of services (if an elimination period applies, see above). To continue your eligibility, a licensed health care practitioner will need to recertify your written plan of care and continuing need for qualified long-term care services every year thereafter. Help with Coordinating Care Where should you receive care? How can you coordinate the payments? To assist you in accessing your long-term care benefits, Pacific Life provides Care Coordination Services at no additional charge. You may choose to use Care Coordination Services outside of Pacific Life s, but any policy benefits paid out for such services will reduce the total long-term care benefits and are subject to the maximum monthly benefit. International Benefit Pays a cash benefit equal to the monthly maximum benefit for nursing home care received outside the United States. Your actual benefit duration will be adjusted based on any long-term care benefits you have already received and is generally available up to the first 24 months of claims. 11 Benefits paid for these services are limited to lifetime maximum amounts. Certain states may also limit benefits for these services to the monthly maximum benefit amount. 7 six Other Policy Benefits After you make your one-time premium payment, your policy s long-term care benefits, death proceeds, and Return of Premium Benefit are guaranteed. 12 Your Pacific PremierCare Advantage policy also provides the following benefits. Residual Death Benefit If the only distributions to occur under your policy are for long-term care benefits, your beneficiaries are guaranteed to receive an amount equal to the lesser of 5% of your initial face amount or $5,000. If you never use long-term care benefits, your death proceeds are guaranteed to never be less than your premiums paid, less any policy loans, withdrawals, or terminal illness benefit paid. Terminal Illness Benefit This feature allows you to access up to the lesser of $500,000 or 75% of your policy s face amount if you are diagnosed as terminally ill with 12 months or fewer to live. 13 This benefit is reduced by policy loans, withdrawals, and long-term care benefits paid under the policy. Long-Term Care protection if you need it. A money back option (Return of Premium Benefit) 13 if you don t. Pacific Life The Power to Help You Succeed Offering insurance since 1868, Pacific Life provides a wide range of life insurance products, annuities, and mutual funds, and offers a variety of investment products and services to individuals, businesses, and pension plans. Pacific Life also counts more than half of the 100 largest U.S. companies as its clients. 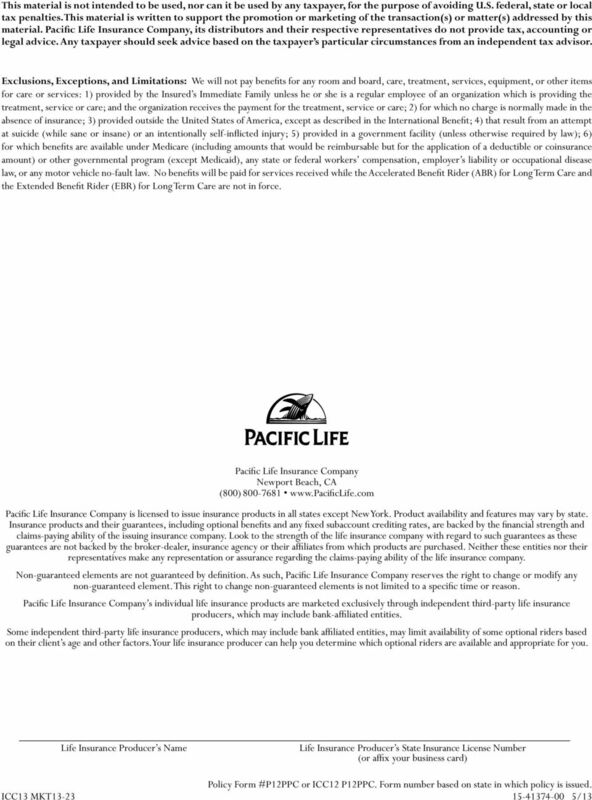 For additional company information, including current financial strength ratings, visit Pacific Life online at Pacific Life refers to Pacific Life Insurance Company and its affiliates. Client count as of May 2012 is compiled by Pacific Life using the 2012 FORTUNE 500 list. 12 Policy benefits are reduced by any policy loans, withdrawals or Terminal Illness Benefit paid under the policy. Death Proceeds and Return of Premium Benefit will be reduced when long-term care benefits are taken. 13 In certain states, this benefit may be provided through the optional Accelerating Living Benefit Rider (Form #R06ALB). Riders will likely incur additional charges and are subject to availability, restrictions and limitations. When considering a rider, request a policy quote from your life insurance producer to see the rider s impact on your policy s values. The cost of exercising the Terminal Illness Benefit or the Accelerated Living Benefit Rider provision is that the death benefit is reduced by an amount greater than the benefit payment itself to reflect the early payment of the death benefit. Benefit payments will reduce the death benefit, Return of Premium Benefit, Coverage Charge, net cash surrender value, and any policy debt. Additionally, benefit payments may adversely affect the benefits under other riders. Tax laws relating to accelerated death benefits are complex. Receipt of accelerated death benefits may affect eligibility for public assistance programs such as Medicaid. Consult with qualified and independent legal and tax advisors for more information. Succession and Exit Planning Using Life Insurance. June 2011 1 Hour CE MKTG-OC-841A For Insurance Professional Use Only. Not for Use with the Public.